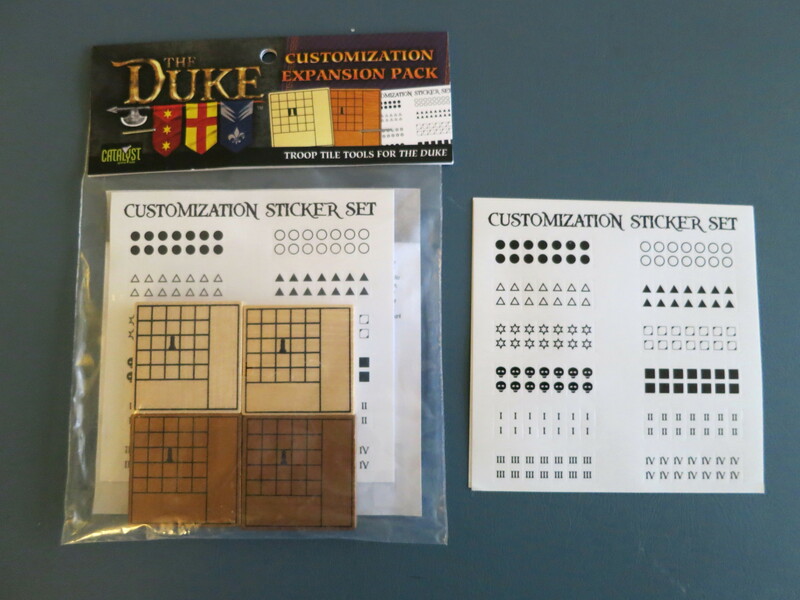 In June 2012 I backed a Kickstarter for an interesting two player game called The Duke. It employs a unique mechanic that has pieces flipping over after each time they move, with their available next move dependent on which side is currently face up. It took about a year and a half for the game to be produced and delivered, and it sat on my shelf for nearly that long again as my gaming was long limited to three plus player games. I finally got an opportunity to play recently, and my only disappointment is that I waited this long to try it. While it will undoubtedly take a long time to learn the intricacies of using each piece to its full potential and the numerous possible strategies the game provides, learning enough to play took minutes. 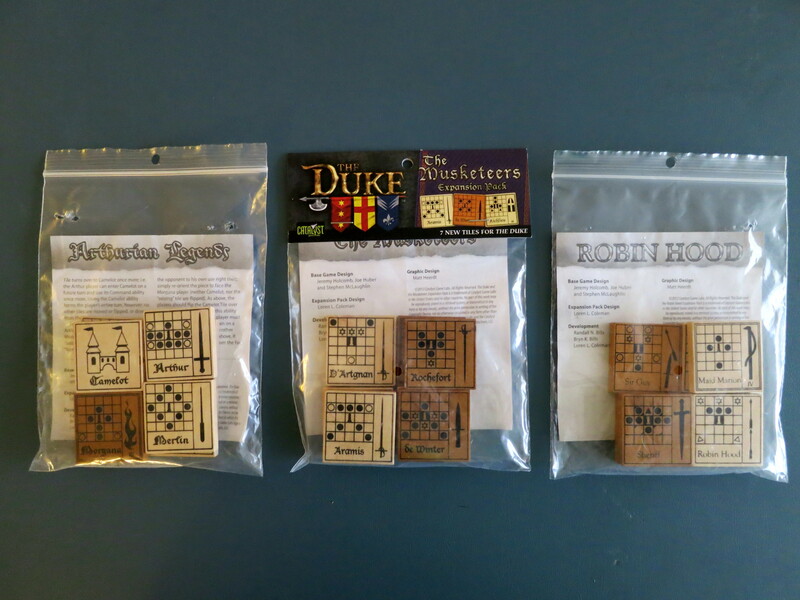 Both players start with their Duke and two Footman. 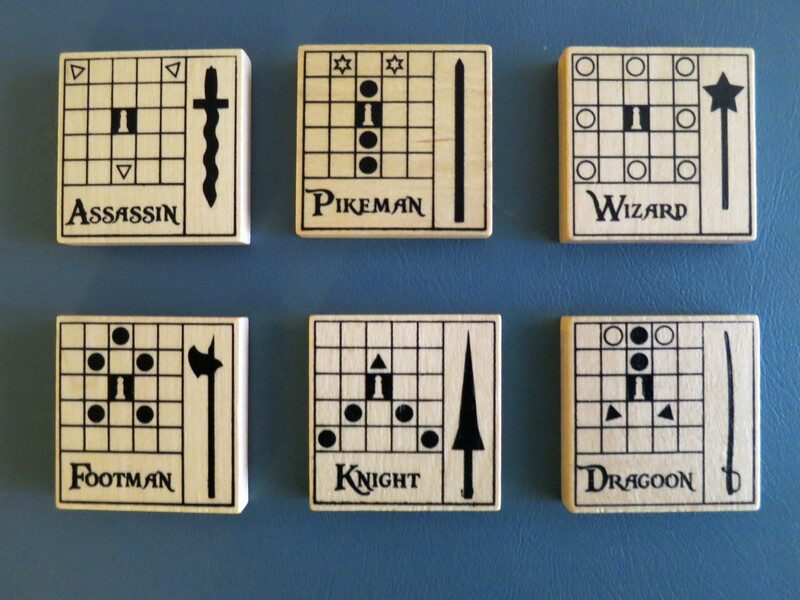 On each turn two actions are available: move one of your pieces on the board or bring a random piece from your reserves into play in any free space adjacent to your Duke. 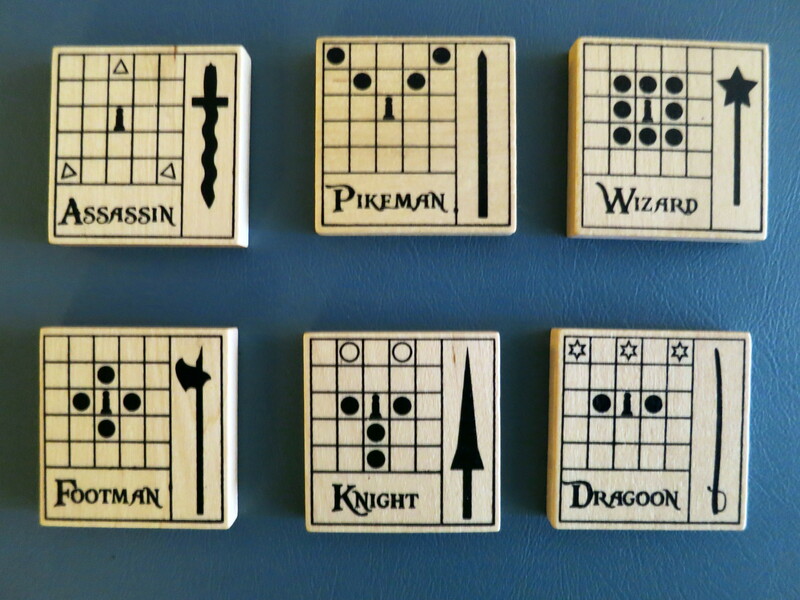 As mentioned above the key innovation of the game is that every piece has two distinct movement patterns indicated on its two sides. They can vary wildly and it’s extremely interesting and fun to try to plan your moves taking into account what the piece you’re using will be able to do next turn. Possible moves include basic orthogonal or diagonal movement, jumping adjacent pieces, capturing pieces at a distance without moving, etc. … and the flip side movement patterns for the same pieces. There have been a fair number of comparisons to chess, and the influence is obvious, but I found this much more accessible and enjoyable. The vast number of movement patterns allows for deep gameplay, yet the smaller board and limited starting pieces keeps things manageable. The biggest chess parallel is the game’s goal: capture your opponent’s Duke. There is even a “check” equivalent (called “guard”). 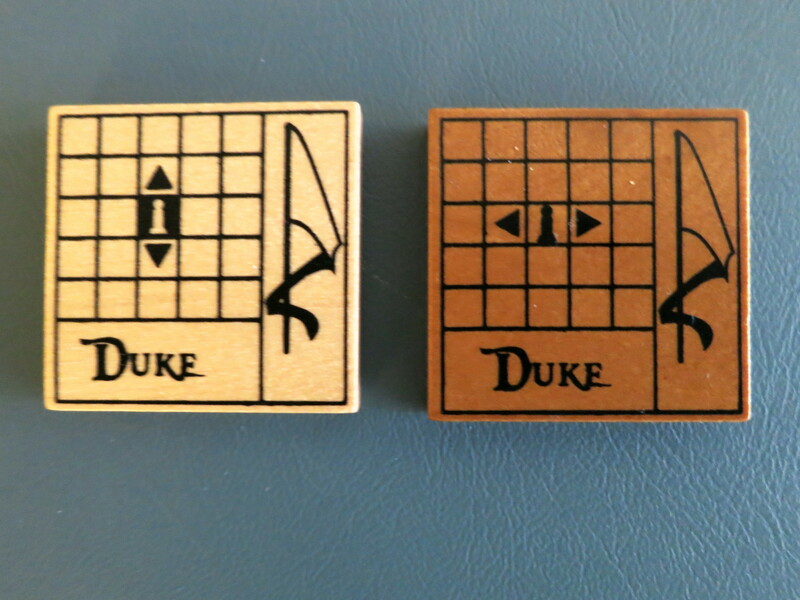 But despite this commonality The Duke is solidly its own game, feeling unlike anything else I’ve played. And I adore the fact that the Duke, while limited, is still quite powerful. He is basically a one directional rook, with his sides alternating between vertical and horizontal movement. This is fantastic because he can defend himself somewhat and get out of tight situations, but can still be cornered and trapped if you’re not careful. Your mission: protect your Duke at all costs. The game plays quick. We were able to get three games in around an hour, although I expect that will change once we get better at it. Throughout those three games we didn’t even see all of the fifteen different troop types in the base game, so it will be a VERY long time before it starts to feel the same from game to game (if it ever does). But there’s even more variety to be had regardless. Expansions based on Arthurian Legend, Robin Hood, and The Three Musketeers. Several expansions based on classic literature and legends have been released. While in the base game each player has identical forces, these sets are asymmetric and contain pieces molded after certain characters which are swapped with particular pieces from the base game. I have not tried any yet but I love the idea and the sets I have look great. If that somehow isn’t enough, there’s also a pack of blank pieces with movement stickers available to design your own units. 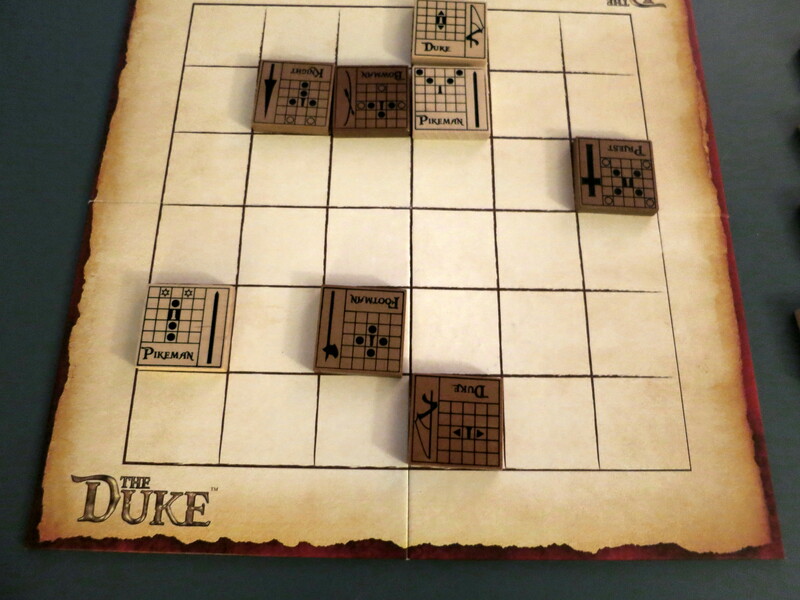 Overall the Duke is easy to learn, quick to play, has great production value, and is a blast. Suffice to say I’m incredibly impressed and will be playing it for a long time to come.